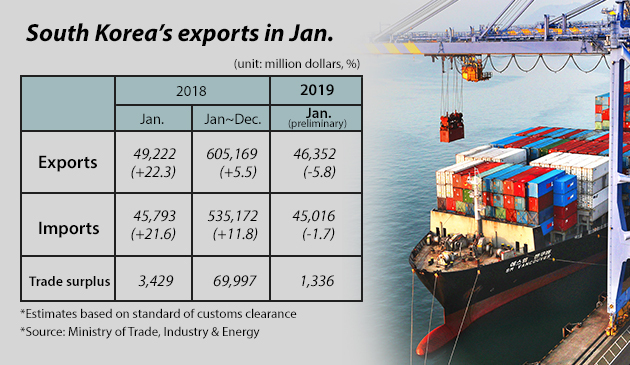 South Korea’s exports fell for the second month in a row in January due to softening in chip demand and reduced demand from China engaged in trade fallout with the United States. The country’s exports in January totaled $46.35 billion, down 5.8 percent from the same month last year and steeper than the 1.3 percent fall in December, according to data released by the Ministry of Trade, Industry and Energy on Friday. The last time exports declined back to back was in September-October 2016. Easing in shipments largely owed to the downtrend in semiconductors that sustained double-digit growth last year. Semiconductors that make up nearly 20 percent of the country’s total exports plunged 23.2 percent from a year ago period amid weakening demand from global IT companies that have put off investment plans and reduced orders for inventory adjustment. Memory prices also have softened with price of 8Gb DRAM sinking 36.5 percent and 128 Gb NAND flash 22.4 percent against a year-ago period. The country’s petroleum and petrochemical exports contracted on weaker oil prices. Nine out of the country’s 13 mainstay exports items turned weaker – semiconductors (23.2 percent), petroleum products (4.8 percent), petrochemicals (5.3 percent), ship (17.8 percent), displays (7.5 percent), wireless communication devices (29.9 percent), textile (3.3 percent), computers (28.2 percent), home appliances (0.3 percent). Gainers were general equipment (up 1.7 percent), automobile (13.4 percent), steel (3.3 percent) and automotive parts (12.8 percent). Automobile shipment improved for the second straight month, thanks to robust sport utility vehicle and electric car sales in the U.S as well as Europe and Commonwealth of Independent States (CIS). By country, exports to China that was responsible for 26.8 percent of Korea’s total exports last year shrank to 19.1 percent in January from a year earlier. Korean exports to China – mostly intermediary goods – suffered for the last three months amid ongoing trade war between the U.S. and China. Shipments to the Middle Eastern countries shriveled 26.3 percent on year, to the Central and South Americas down 11.1 percent, and Vietnam 5.8 percent. Exports to the three of the country’s main trade partners gained for the fourth month in a row in January – U.S (20.4 percent), European Union (11.9 percent), ASEAN countries (6.4 percent) amid strong automobile and automotive parts demand. Shipment to India jumped 17.1 percent on year, extending a growth streak for the fifth month, while exports to CIS surged 44.3 percent. Trade surplus came at $1.34 billion, but the black figures were significantly smaller against the monthly average of $5.9 billion last year. Imports fell 1.7 percent to $45.0 billion over the cited period. Imports of crude oil and copper contracted amid easing in commodity prices. Manufacturing equipment imports were reduced as chipmakers paused facility investment. Imports of liquefied natural gas shot up 20 percent due to increased employment of the fuel to power plants. The trade ministry explained exports remained strong but deteriorated in value as the result of weaker component and commodity prices. In January, exports volume expanded 8.4 percent from a year ago but the per-unit export price plunged 13.1 percent on year. Rebound in exports will hinge on recovery in international chip and oil prices, the ministry added.